Mongolia: The Land of Manly Men? | WWAM Bam! “OohhhH!,” said the two young female Mongolian teachers, in stereo, as we walked across the parking lot towards the elementary school where we’d be working together. “Then you must like a manly man,” said one of them, while the other smiled in agreement. I found the comment both curious and comical. But that was my first time to hear it. I’ve since heard it numerous times, and always from Mongolian women. Mongolians, upon learning that I am married to one of their own, show a look of surprise–with eyes opening wide and an audible “Oh, really?” As in other Asian countries, it’s far more common to see a Western man with an Asian woman, and less common to see my pairing–a Western woman with an Asian man. But the tides are shifting, as you can see in our recent posts sharing Stunning Photos of WWAM couples in love round the world (Initial Post-April 2017, Second Post-June 2017). But back to that phrase–manly men. When I ask what is meant by it, the woman usually makes an impression of a strong man (making muscles) and a tough or stern face. This has only puzzled me more. Certainly from living in the U.S. I’ve been introduced to various forms and interpretations of masculinity. I’ve encountered stereotypical Hispanic machismo and watched as many a nice guy seemed to finish last (and then didn’t). I grew up in the woods where my father taught us to hunt and fish. I joined the Army National Guard when I was 17 and pride myself on being both self confident and independent. I was not looking for a manly man. But I am living in what one has coined as Mangolia, and I am married to a Mongolian man. With my father and husband. 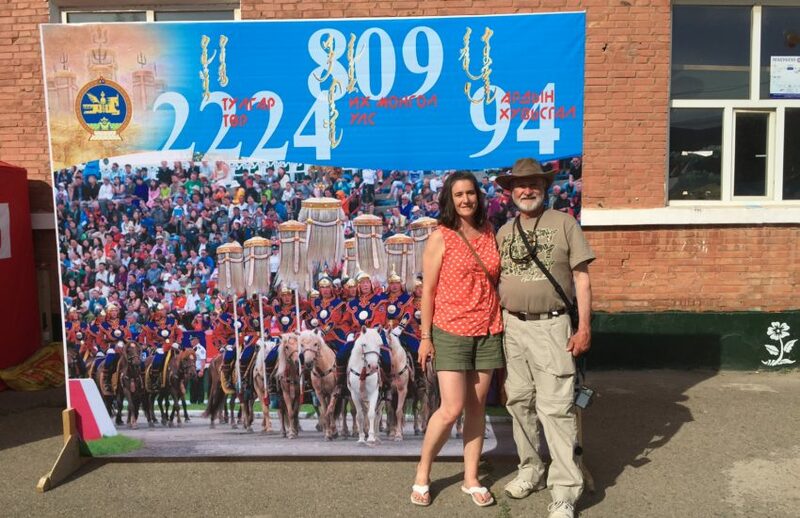 The phrase may originate from the National Festival of Naadam, celebrated every year July 11-13 in Ulaanbaatar, and throughout summer across the provinces of Mongolia. It celebrates contests in what are called “the three manly games”–wrestling, horse racing, and archery. I have heard Mongolian men criticize men of other Asian nations for wearing skinny jeans, for being too “pretty” with their personal grooming, and for not having [what I perceive they see as] skills in resourcefulness. I’ve never lived in other Asian countries and beyond spending three weeks on Hokkaido in my early twenties on a joint military exercise, I have had no experiences with other Asian men. I’m sorry to say my high school and colleges either lacked diversity, or I was too busy working full time and doing school full time to be active in many social circles. 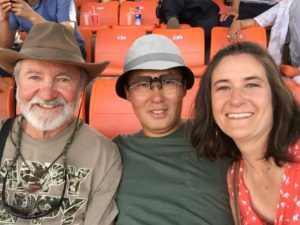 After two years in Mongolia, I’ve fleshed out some of the reasons why a Mongolian man is considered manly. First and foremost, men here do have a basic understanding of how things work mechanically, and with incredible resourcefulness will attempt to fix or repair or make almost anything! Perhaps this comes from their nomadic history–when something breaks in the middle of nowhere, you must fix it with what you have on hand. There is no Walmart to run to! In Mongolia, most vehicle owners/drivers are also mechanics. If a sink isn’t draining, the man of the house won’t hesitate to dismantle it, clean it, and reconstruct it. They may not know what to do, but they will not hesitate to try and repair it. I appreciate and admire their willingness to get dirty, and figure things out. If they get stuck, they also won’t hesitate to find a friend or acquaintance that CAN sort it out. They ARE some of the most resourceful people–men or women–I’ve known in my life and travels. Compared to the American men I’ve known, Mongolian men are refreshingly open and direct. If they don’t know the directions, they ask. And they will ask repeatedly until they arrive to their destination. This is different than an American male driving around looking for a place and refusing to stop and ask for help. Course some of this probably has to do with Mongolians not being taught map skills. Their knowledge of directions and navigation are based on interpreting the landscape and maneuvering around landmarks. Yet, there is a dark side to this “manly” identity–Mongolian men don’t seem to hesitate if violence is felt necessary. I’ve observed many fights in my time here: at 6 a.m. at a taxi stand, in the evening outside a restaurant or bar, and even walking down the street in broad daylight in the afternoon. They do not hesitate to throw a punch or initiate a scuffle. Domestic violence is an issue that has drawn attention in recent years. It is now being addressed through new governmental laws that recognize domestic violence as a criminal offense. This is good news considering that Russia, considered by some as Mongolia’s big brother, has been moving in the other direction, diminishing the harm done to families by domestic violence. All that said, I chuckle when I hear a new acquaintance comment that I must like a manly man. I love my husband for all his gifts, for how he loves and cares for me. People fit together like puzzle pieces and I could no sooner put him in a single category or box, than he could me. We are man and woman, Asian and Western, Buddhist and Christian (in our up-bringings), multi-lingual and monolingual, and any number of other classifications. As human beings, we are each of us individuals that hold both masculine and feminine qualities, and our failure to remember or honor this may be what leads to our discontent. I work to see the multitude in me, in him, in each of us. What about you? Where’s Wang: Will There Be a “Dangal” Effect in China?